Claire Bremner is used to stepping outside of her comfort zone. The 27-year-old grew up in Hobart but took herself on a working holiday to Bristol in the UK when she was just 19. “I worked in hospitality and had to try to make ends meet, which was challenging in all sorts of ways,” she says. Claire later studied in Shanghai as part of her arts degree in international relations, and also travelled throughout Central and South America before taking up a Master of Management course at the University of Melbourne. The overseas experiences helped broaden Claire’s idea of “what I thought was possible” and it is little surprise that she ended up switching to the University of Melbourne’s one-year Master of Entrepreneurship program, delivered at the Wade Institute of Entrepreneurship. Not only was Claire accepted, but she was also awarded a $25,000 Neville and Di Bertalli Scholarship, which supports students starting businesses and innovating in the field of agriculture. 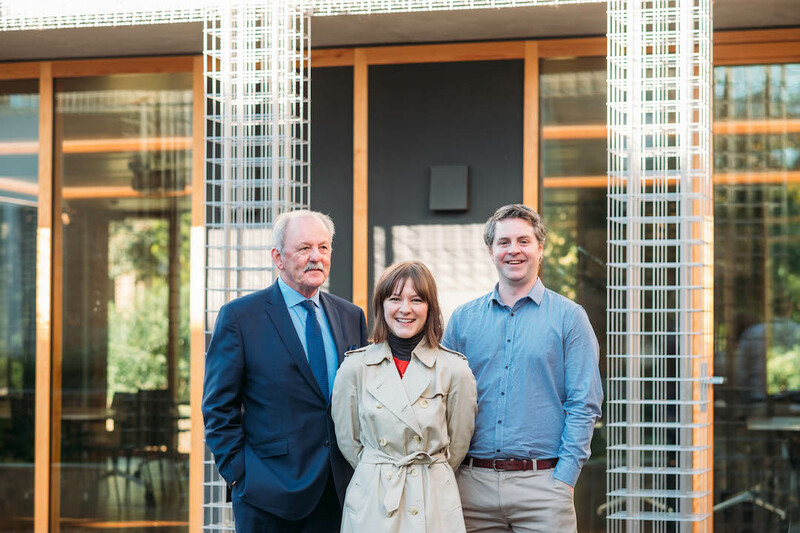 From left: Scholarship benefactor Neville Bertalli with recipients Claire Bremner & Paul Lockwood (2018). The Master of Entrepreneurship program is delivered at the Wade Institute, which was set up by entrepreneur and benefactor Peter Wade some three-and-a-half years ago. Wade Institute General Manager Georgia McDonald says the Master of Entrepreneurship aims to address Australia’s relatively low rate of commercialisation in the startup space, while providing economic opportunities for the younger generation. “Australia has the brains and the resources to create start-ups, but we don’t necessarily have the same level of commercialisation of businesses that they do in other OECD countries,” Ms McDonald says. The program is in its third year and only 30 to 40 people are accepted each intake. “We know that nine out of ten startups currently fail, but if we can help get that rate down to four or five out of ten we will be happy,” Ms McDonald says. She explains when assessing applicants, her team looks for students that want to start values-based businesses. “We do get applications for startups that aren’t a great match, such as online gambling dens, and that is obviously not what we’re interested in,” she says. When interviewing applicants, Ms McDonald and team also look for a suite of personal traits that will act as a ballast in the stressful world of entrepreneurship. “We look for a level of confidence with ambiguity,” Ms McDonald says. “I know everyone is uncomfortable with ambiguity to various degrees, but people who are highly structured and need that structure may struggle. Finally, there is the trait of humility. It may not be a word you would associate with startup culture, but Ms McDonald says it was often a defining trademark of a successful entrepreneur. “People with humility will often not be concerned about making a fool of themselves,” she says. Originally published via The Weekly Times.